STEM stands for to science, technology, engineering and math concepts. FIRST LEGO League Jr. is designed to introduce STEM concepts to kids ages 6 to 9 while exciting them through a brand they know and love − LEGO®. Guided by adult Coaches, teams (up to 6 members, grades K-3) explore a real-world scientific problem such as food safety, recycling, energy, etc. Then they create a Show Me poster that illustrates their journey of discovery and introduces their team. They also construct a motorized model of what they learned using LEGO elements. In the process, teams learn about teamwork, the wonders of science and technology, and the FIRST LEGO League Jr. 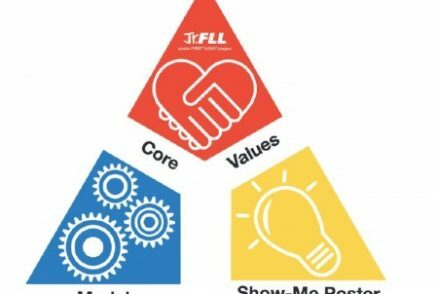 Core Values, which include respect, sharing, and critical thinking. At the close of each season, teams come together at Expos to strut their stuff, share ideas, celebrate, and have fun! – We are a team. – We do the work. Our coaches and mentors help us learn, but we find the answers ourselves. – We share our experiences and discoveries with others. – We are helpful, kind, and show respect when we work, play, and share. We call this Gracious Professionalism®. – We are all winners. Every year, FIRST®LEGO® League Jr. works with experts in the field to create a Challenge that relates to an important real world issue. Past Challenges have been based on topics such as nanotechnology, climate, quality of life for the handicapped population, and transportation. The end result of the design process is a Challenge with two defined parts – the Show Me Poster and the Model. – Create a Show Me Poster using a flat poster board or tri-fold presentation board. – Use words, drawings, photos, and small objects to tell about what they have learned during their Challenge research. – Show where they hunted for answers and describe the people they spoke with on their journey. – Describe their Model and simple machine. – Tell about the team itself. – Create a Model that fits within a 15” x 15” footprint. – Design a Model made of LEGO® parts. Typically, a team of six will use 400 to 1,000 LEGO parts during the season. – Must have at least one motorized piece on the Model. – Create a simple machine using LEGO ramps, levers, pulleys, gears, wheels and axles, screws, or wedges and incorporates this into their model.